McGee stars in Enniskillen 100 return with 5 wins! 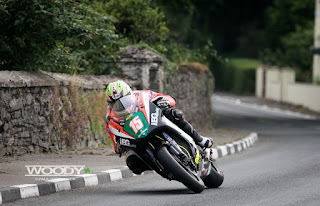 Derek McGee’s winning form continued today at the Enniskillen 100 where he won the 5 races allowed to enter. Yesterday’s qualifying sessions left the Westmeath rider with pole position in the Superbike, Supersport and Supertwin races around the rejuvenated track on its return to return to the road racing calendar setting him up for a full programme. McGee began the day winning the Erne Insurance Supersport race on the NJ Doyne ZX6r and backed it up with another win in the Fermanagh and Omagh District Council Open race on the MSS ZX10r. Competing in much the same classes was Adam McLean and provided Derek with an honest contest. Race 7 was the Armstrong Engineering Supertwin outing on the TT podium bike built by KMR’s Ryan Farquhar and Derek won once again from McLean and Thomas Maxwell in 3rd. After a brief rest, the second Supersport race was called, sponsored by Euro Actions. Again McGee stretched his legs took the win. Adam McLean was 2nd and Kevin Fitzpatrick 3rd. The last race of the day was the Richard Britton Memorial race sponsored by Fermanagh and Omagh District Council. This was an 8 lap race the provided win number 5 for the Mullingar man, again on the ZX10r. Adam McLean was 2nd again with Graham Kennedy 3rd. Both Supersport races saw the welcome return of Cork native Ray Casey after his high speed accident in Mondello Park back in March. Casey qualified a credible 6th on the grid and finished 6th in race 1. He also managed to go one better in race 2 finishing 5th.